INTRODUCTION A number of studies have identified predictors of perioperative mortality for open surgery and include variables such as ASA score, ascites, electrolyte abnormalities, and surgeon experience. In comparison, predictors of 30-day mortality in patients undergoing laparoscopy have yet to be defined. 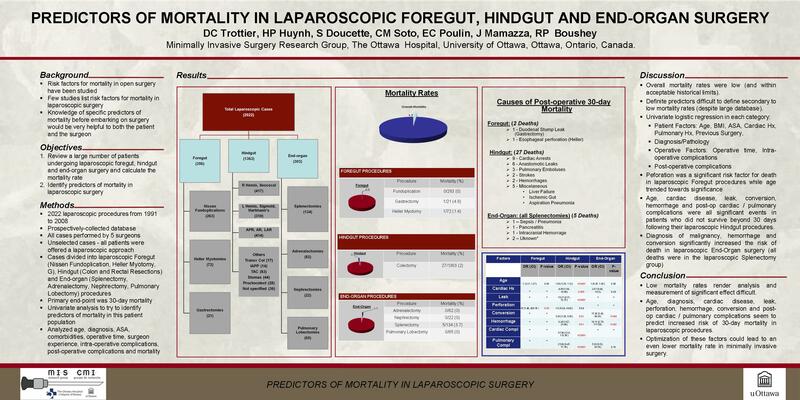 This study aims to identify factors predictive of 30-day mortality in patients undergoing advanced laparoscopic abdominal and thoracic procedures. METHODS A large prospectively-collected database of 2032 laparoscopic procedures was reviewed. Contributions from five surgeons working in four academic institutions were recorded from 1991-2008. There was no observed selection bias as all patients were offered a minimally invasive approach for their procedures. The primary outcome was 30-day mortality. Interventions were divided into foregut (Nissen fundoplication, gastrectomy, and Heller myotomy [355 patients]), hindgut (colectomy [1375 patients]) and end-organ procedures (adrenalectomy, nephrectomy, splenectomy and pulmonary lobectomy [302 patients]). Variables analyzed included diagnosis, medical comorbidities, as well as procedural factors such as operative time, intra-operative and post-operative complications. A univariate regression model was utilized to identify predictors of mortality. RESULTS A total of 34 (1.7%) mortalities were observed in the 30 days following surgery. A breakdown of mortality by anatomic site revealed 2 deaths in the foregut category (1 gastrectomy, 1 Heller myotomy [0.6%]), 27 deaths in the hindgut category [2%] and 5 deaths in the end-organ category (all following splenectomy [1.7%]). The observed causes of death for foregut were duodenal stump leak (1) and esophageal perforation (1). In the hindgut group they included cardiac arrest (9), leak (6), pulmonary embolus (3), stroke (2), hemorrhage (2), as well as various other rare causes (liver failure, ischemic gut, aspiration pneumonia). For end-organ, observed deaths were limited to the splenectomy group and included sepsis, pancreatitis, intra-cranial hemorrhage and cardiac arrest. Analysis revealed that age, perforation/leak, a past history of heart disease as well as post-operative cardiac and pulmonary complications all increased a patient’s chances of dying following laparoscopic abdominal surgery. For both foregut and hindgut categories, age and intestinal perforation or leak were the greatest predictors of death. A subgroup analysis in the end-organ category suggested that 30-day mortality was greatest in patients with hematologic malignancies and was independent of the surgical indication. Surgical experience was not a predictor. CONCLUSION While the total number of mortalities in this cohort is acceptably small, this study provides important insight into predictors of 30-day mortality. It allows for identification of higher risk individuals and also permits potential optimization of these factors.